Humanity’s enduring love affair with plastic, a love more pronounced in the Southeast Asian region, has claimed another victim. This time, the victim is so rare that it was once thought to have been extinct 65 million years ago and is known by the moniker “living fossil”. This week, pictures have surfaced of a dead Coelacanth taken by a fisherman in Indonesia in 2016 but only recently shared. Potential cause of death: Lay’s Potato Chips plastic food wrappers around its intestines. Only two out of 90 historical species of the Coelacanth are known to still be extant in the waters off Kenya, Tanzania, Mozambique, South Africa, Madagascar, Comoros and Indonesia. The endangered Coelacanth now joins a heart-breaking group of marine animals threatened by the increasing amount of plastic debris in our oceans. 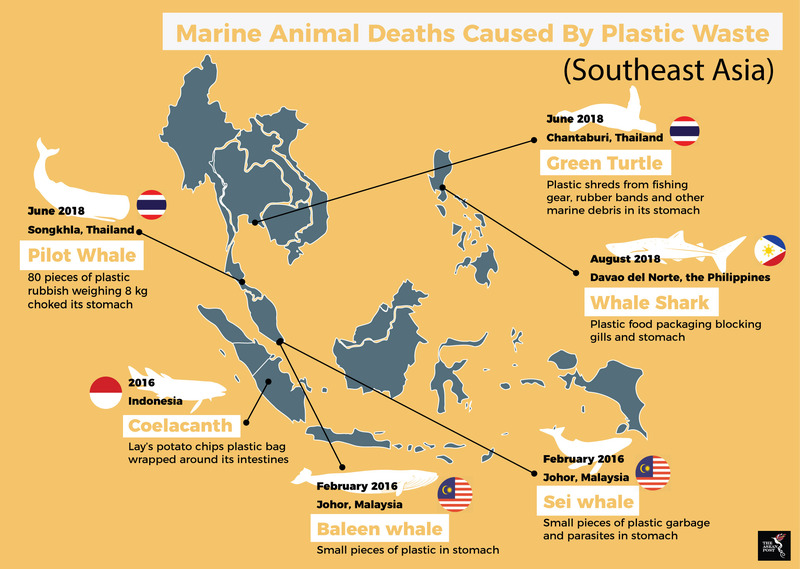 In Southeast Asia, a number of endangered marine animals killed with large amounts of plastic in their stomachs have been reported by the media. In June, a Pilot whale was found beached in Songkhla, Southern Thailand, choked to death by 80 pieces of plastic rubbish weighing eight kilograms in its stomach. In the same month, a Green turtle was found dead in Chanthaburi, Thailand, with plastic shreds from fishing gear, rubber bands and other marine debris in its stomach. In 2016, a Sei whale and a Baleen whale were found beached in the southern Malaysian state of Johor. Although it was not a conclusive cause for their deaths, plastic debris was found in their stomachs. These cases highlighted in the media are only the tip of the iceberg. While cases involving large or iconic species such as whales, dolphins and turtles are given a lot of media attention, many other animals from less iconic species killed by marine plastic debris are often sadly overlooked. A marine biologist and lecturer at Kasetsart University, Thon Thamrongnawasawat, told the media that about 300 marine animals die each year in Thailand as a result of ingesting plastic. Globally, it is estimated that over 100 million marine animals are killed each year by plastic waste. This include species mentioned above as well as fish, seals and birds. In its reports, the United Nations Environment Programme (UNEP) estimates that over 300 million tons of plastic are produced every year, half of which is used in making single-use items such as shopping bags, cups and straws. Only nine percent of the nine billion tons of plastic the world has ever produced has been recycled, with the remaining ending up in landfills, dumps or in the environment. This includes at least eight million tons of plastic ending up in the oceans every year. Floating plastic debris is currently the most abundant item of marine litter, making up 80 percent of all marine debris. Five Southeast Asian countries, namely Indonesia, the Philippines, Vietnam, Thailand and Malaysia are among the top 10 countries worldwide ranked by mass of mismanaged plastic waste. The five ASEAN member states collectively contributed 8.9 million metric tons of mismanaged plastic waste, defined as material that is either littered or inadequately disposed in dumps or open, uncontrolled landfills. Mismanaged waste could eventually enter the sea via inland waterways, wastewater outflows, and transport by wind or tides. According to the International Union for Conservation of Nature (IUCN), marine plastic pollution has affected at least 267 species, most visibly and disturbingly by ingestion, suffocation and entanglement. Floating plastic waste is often mistaken for food by marine animals and once ingested, these animals will die slowly of starvation as their stomachs are filled with plastic debris. Divers would attest that a shark whale sighting is one of the most desired encounters of the marine kind. The slow-moving filter-feeding gentle giants have been described as majestic and magical, putting many of those who are lucky enough to meet them in the wild into a trance with their gracefulness. This week, a whale shark was found beached on the Philippine shores of Tagum City in Davao del Norte. Environmentalist Darrell Blatchley reported that there was plastic waste lodged in the gills of the 14-foot juvenile whale shark which had to be pried out, while more plastic waste was found inside its stomach, blocking the fine filters of its intestines. He added the whale shark was also underweight and emaciated. The UNEP estimates that the economic damage caused by plastic waste in the Asia-Pacific tourism, fishing and shipping industries is about US$1.3 billion every year. This represents 10 percent of the total annual economic damage to the world’s marine ecosystem caused by plastic. It is undeniable that plastic is a useful material in our everyday life. However, its use should not be at the expense of the environment as we clearly cannot cope with the amount of plastic waste we generate. Unless we rethink our toxic relationship with plastic, our addiction to it could prove to be detrimental and even fatal to all life on the planet.